B.C. men’s pairs playing against Manitoba ‘B’. It was in the Canadian Women’s Triples gold medal game that produced the most exciting finish of the Championship’s final day. In the last end, down three against a feisty Alberta trio, B.C.’s front-end of Belle Chan and Ann Van Bastelaere were able to set up their skip for a chance to move the jack a yard to score. Mary Wright did just that, nailing all three of her Skip bowls and moving the jack just as planned. The game would then go to an extra-end. In the shootout, the B.C. women were able to surround the jack with three of their bowls but one sneaky Alberta bowl was a tad closer. Wright missed all three of her attempts to move the bowl or jack after Alberta had put in a few good blocking shots. The B.C. 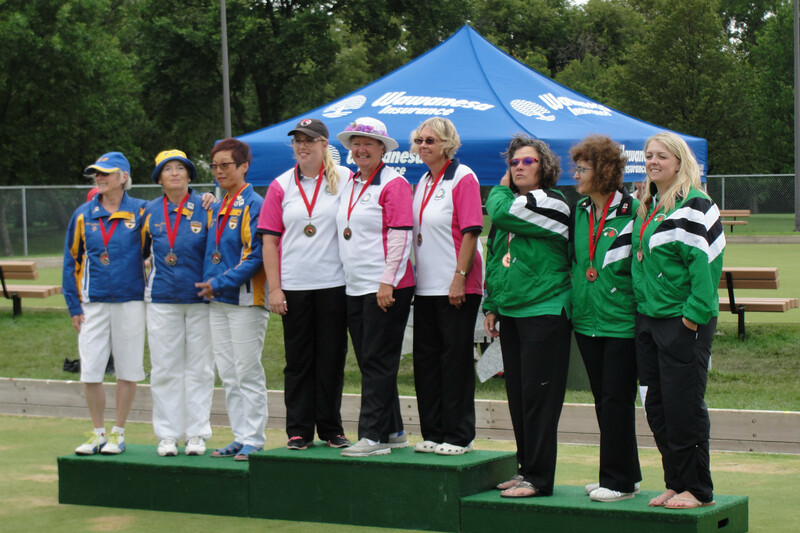 girls would get silver by a one bowl difference to the champions Alberta ‘A’; Claire Day (Skip), Amanda Berg and Val Wilson. 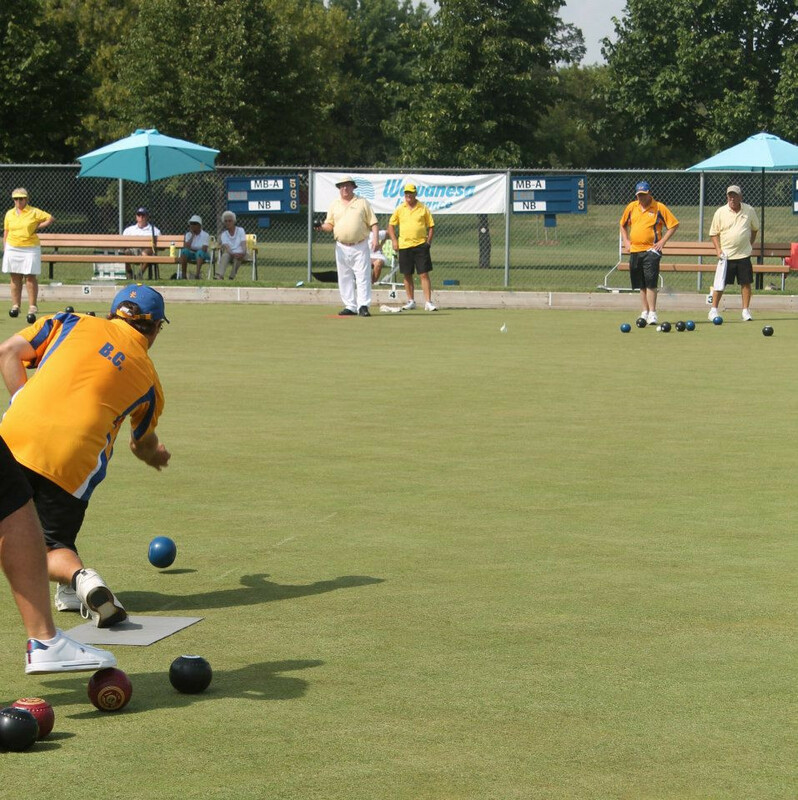 The drama was high all week long at the 2014 Lawn Bowling National Championships held in Winnipeg, Manitoba. The players went through extreme heat, extreme rain and finished off with a sort of Vancouver type cloud and mist all which produced unique challenges during the week. A game that was delayed from Monday until Friday due to weather, was a game more memorable than the final for the B.C. pair of James MacGowan (Skip) and Jon Braun. Early in the game B.C. scored a perfect end (8 shots), only to see a big lead slip to the four and three time champions from Nova Scotia, Steve Ogden (Skip) and Steve Bezanson. Though B.C. were down two in the head, MacGowan’s last bowl of the game was set up nicely, trailing the jack five-feet for three points to win 24-23. The B.C. pair would advance to the gold medal game and as a bonus sit number one in the rankings. The Men’s Pairs final was not the game people were hoping for. All four players battled against the green more than their opponents. But it was MacGowan and Braun who figured out how to play a rink with a negative bias better than Stan Nelson (Skip) and Jeff Dobson, of Alberta ‘B’, to take a seven point lead with one end to go. Make the final 18-14 and the first gold for B.C. that day and the first for MacGowan and Braun. Also in the number one seat was the B.C. Rinks team. Cary Manns (Skip), Vince Mai (Vice-Skip), Kin On Lau and Clement Law steadily put the wins on the board, with only one loss in round-robin play. Their final game proved why these are four of the steadiest and deadliest bowlers in Canada. 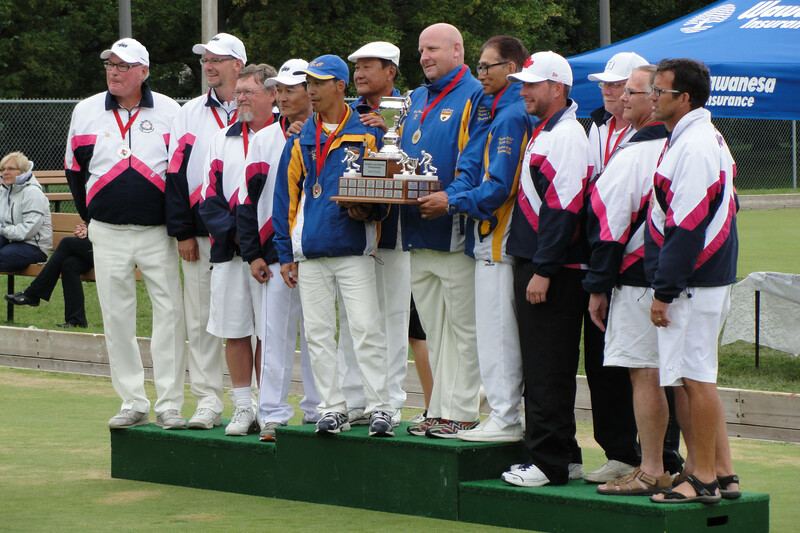 The four of them defended B.C.’s title and also won their first golds with an 18-9 final over the highly experienced Alberta ‘A’ team of Lyall Adams (Skip), Pat Bird (Vice-Skip), Dave Cox and Peter Mok. Ann Mathie (subbing for Sandy Yau), Marlene Cleutinx and Josephine Lee. B.C. would pick up one more medal with the prowess they know how. 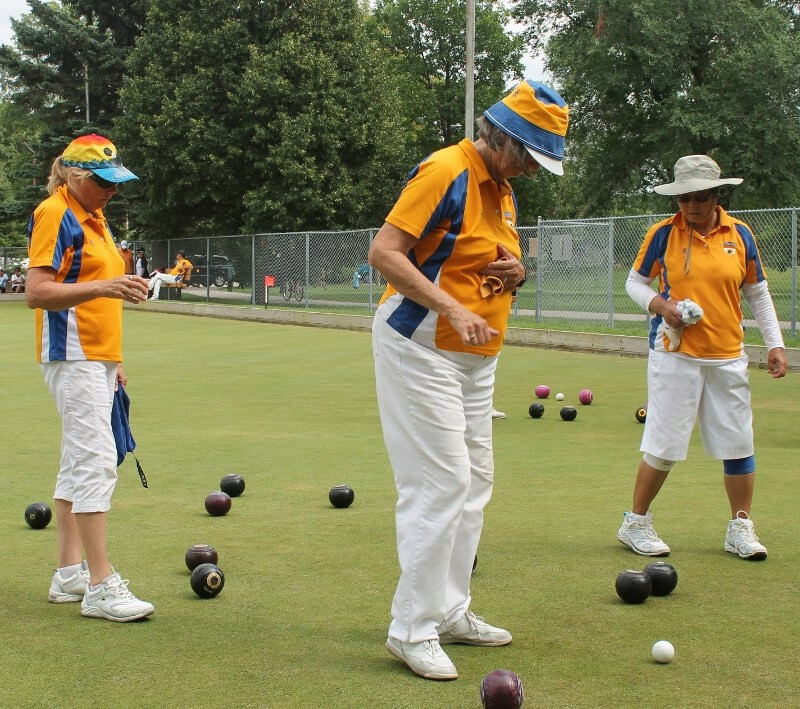 In the Women’s Fours, Marlene Cleutinx (Skip), Josephine Lee, Sandy Yau and Rita Patterson easily handled the Manitoba ‘A’ team with a final of 24-6. It was an unfortunate case of closes loses and a tie that saw this B.C. team ranked third in round robin play. B.C. men’s triples, German Santana (Skip), George Cubiss and Malcolm Taylor and women’s pairs, Marie Taylor (Skip) and Nancy Leung placed outside the medal rounds but were still fierce competitors on the greens. A big thanks goes to the team managers, Dave Mathie and Ann Mathie, for looking after our players while on the road and for the morale support needed to get through tough times. The B.C. men were also only one ranking point out of winning the Cy English award for best overall side. Saskatchewan ‘A’ won the men’s while Manitoba ‘A’ won the Lady Alexander, the women’s overall.